First three buttons represent three program work modes. Button of the current work mode is always checked. Perform search on Youtube within the program. Clips from search results then can be selected to download. About search window usage you can read in topic Search and feeds. About feeds window usage you can read in topic Search and feeds. By click on it appears popup menu with recently used URLs. URL is added there right after analysis and only if analysis was finished successfully. Each item here contains clip URL, the date when it was analyzed (in square brackets) and the clip title. Maximum number of recent URLs can be set in Common options group. Toolbar button is hidden if number is set to zero. Paste an URL from the clipboard to URL edit box and perform operation of the current work mode. So download can be started just in one click using this button in Simple Mode. In Convert Mode it will perform transcoding of the clip by URL in the clipboard. In Advanced Mode it will perform the clip analysis i.e. will show available qualities in quality combo box but will not start actual download. There is also a way to perform these operations by one click even if program is not currently running. See Taskbar tasks topic for more details. List of user interface languages. Translations are provided and maintained by enthusiasts. List of contributors and the way to participate in translation can be found here. Clip info area is an area below URL edit box. By default it contains textual clip info in the left part and thumbnail in the right. Textual clip info consists of the clip title and blank line followed by the clip description. Text becomes selectable when clicked, so you can scroll or copy parts of it. There is a splitter between textual clip info and thumbnail. It becomes visible when mouse pointer is over it. Splitter can be used to adjust the respective sizes of these elements. Move splitter to the left window side to completely hide the text. To completely hide thumbnail go to program options and uncheck Show thumbnails check box. If thumbnail is hidden (using program options or Compact view), it will be not loaded at all (that also will speed up the analysis a little bit). When download is not in progress, here is displayed destination directory and (if it is known) file name. Bar has two ways to display downloading progress. More info and the way to control this can be found in Downloading options group. By click on Browse link can be selected file destination. In Simple and Convert modes file name is automatically set to clip title so you can select only destination directory. In Advanced mode after analysis you can also specify an output file name. 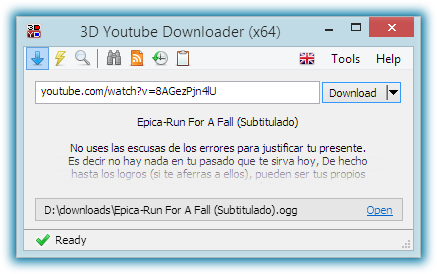 After download there appears Open link which opens downloaded file in associated program (e.g. video player). Both these items are also available though progress bar context menu. Additional item Open Containing Folder there opens Windows Explorer in the directory containing downloaded file and selects this file. Context menu also contains submenu Recent Files. For recently downloaded files there are displayed file path and original URL. Item is disabled if clip is not available on the disk. Otherwise click on it opens file in associated program. Maximum number of recent files can be set in Common options group. Submenu is hidden if this number is set to zero.